Americans love a good villain. While we pride ourselves on our autonomy, when things go wrong we want someone to blame. And there is no place where blame and personal responsibility come into more direct conflict than the argument over the cause of America’s obesity epidemic. By now, most are aware that ours is the fattest nation on earth. Data from the National Center for Health Statistics reports that more than 70% of American adults are either overweight (BMI between 25-30) or obese (BMI greater than 30). What not as many people know is that there are serious health consequences accompanying those extra pounds, with more than 80% of obese individuals suffering from one or more chronic health conditions. There are basically two schools of thought as to why Americans are so overweight: obesity as personal choice versus obesity as a collective responsibility. The former espouses that people are obese for the simple reason that they eat too much and exercise too little, whereas the latter suggests that the ubiquitous access to calorie-dense, nutrient-poor processed foods, combined with poor default choices, and limited access to healthy alternatives has created an “obesogenic” environment over which will power alone is unlikely to triumph. For decades the food industry has staked its tent in the personal responsibility camp. There’s nothing wrong with offering 2,000 calorie lunches as long as they’re cheap and taste good. According to the restaurant industry, there are no bad foods, only bad choices. Any study that reflects poorly is labeled as “junk science” or “fake news.” Despite a growing body of contrary evidence, the food industry continues to stress the importance of exercise over diet as a means of weight control. Exercise has many benefits, but significant weight loss isn’t necessarily one of them. Considering the financial gain inherent in maintaining the status quo, these arguments come off as disingenuous and self-serving. The personal responsibility tribe, that includes not just the food industry but also a majority of legislators and physicians, has consistently maintained that weight gain is simply a matter of “calories in-calories out” and that any government legislation that limits choice, if not unconstitutional, is at least un-American. Who, after all, wants to live in a “nanny state?” Admittedly, this line of thinking plays better to Republicans than Democrats. Unfortunately, the widespread acceptance of this ideology hasn’t helped people lose weight. Instead, it’s gotten us a nation of overweight, over-diseased, and increasingly frustrated fat people. Simplifying weight gain to “calories in-calories out” and then blaming the victim is no more helpful than saying to an alcoholic: “Your problem is that you drink too much.” True, but not helpful. This reasoning provides no understanding of root causes and how to address them. It also ignores the fact that when it comes to other matters of personal choice, Americans are making smarter, better decisions: smoking is down, seatbelt use is up, teen pregnancy is down, condom use is up, opioid use is finally on the decline. What’s so different about food? The obvious answer is that, while food is essential for life, the other aforementioned health-related behaviors aren’t. We all have to eat, but this fails to account for why so many Americans are overweight. And this is where societal decisions have a role to play. The omnipresent access to sweet, salty, fatty foods appeals to our genetic hard wiring in a way not easily overcome. By offering snacks at every gas station, reception area, lunch meeting, and coffee break, we are inundated with messages to eat. Within five miles of where I live there are more than 50 grocery stores, fast-food chain restaurants, sit-down restaurants, convenience stores, coffee shops, and gas stations serving food. More than one billion dollars is spent annually marketing food and beverages to adolescents and another 870 million dollars marketing them to children. Even hospitals have gotten into the act, with many now offering fast-food choices from the lobby. Now that’s just a little more choice than I require, thank you very much. So, we need a villain, a scapegoat to take the blame off of us, even if this means acknowledging that there are forces outside our control that have led to the obesity crisis. Enter Gary Taubes, the author of 3 well-known books on nutrition, the most recent of which, The Case Against Sugar, hit the best-seller list in 2016. 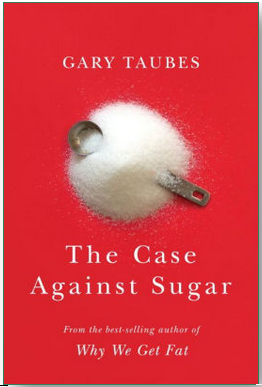 Taubes makes no bones about his intention: “The purpose of this book is to present the case against sugar—both sucrose and high-fructose corn syrup—as the principal cause of chronic diseases that are most likely to kill us, or at least accelerate our demise.” He then spends the next 365 pages doing just that. First, a little chemistry (very little). For the sake of this post when I discuss sugar, I am referring to simple sugars like sucrose (cane sugar), and high-fructose corn syrup (corn sugar). They are nearly identical. Sucrose is a disaccharide composed of a single glucose molecule linked to a single fructose molecule. HFCS (high-fructose corn syrup) is also a combination of glucose bound to fructose but with a slightly higher percentage of fructose; 55% fructose to 45% glucose. The difference may seem trivial but adds up when you consider that a typical 24-ounce soft drink contains between 80 to 100 grams of sweetener. Although glucose and fructose are both simple sugars, their uptake, utilization, and metabolism are entirely different. Glucose is the simple sugar of choice for energy production and the only one that can be used by the brain for energy. Its metabolism is regulated by insulin, which promotes the cellular uptake of glucose from the bloodstream. Type 1 diabetes is primarily an autoimmune, insulin-deficiency syndrome that tends to first strike during childhood or early adolescence. There is plenty of sugar available, but the body is unable to utilize it due to an absence of insulin. Glucose thus accumulates in the bloodstream attracting large amounts of free water. The kidney, when confronted with this excess, works overtime to produce a large volume of sugary urine. The term diabetes mellitus is derived from the Greek word meaning to siphon combined with the Latin word for honey. In contrast to type 1 diabetes where the pancreas fails to synthesize insulin, type 2 diabetes is primarily a disease of insulin-resistance, wherein cells become less sensitive to the effects of insulin over time. In cells, sugar is stored primarily in the form of glycogen, a polymer of linked sugar molecules. When you eat starches, such as rice, bread, or potatoes, you are actually ingesting large polymers of sugar. These in turn, are broken down into mono- and disaccharides by enzymes in the gut that are largely produced by the bacteria living there (our intestinal flora). The individual strains of bacteria in our gut affect how efficiently a complex carbohydrate like pasta is broken down into simple sugars, which is one reason why different individuals experience different net caloric absorption after eating the same meal. Unfortunately, it’s not as easy as simply taking prebiotics and probiotics, as we don’t yet know how to best tip the dietary scale to advantage when it comes to our intestinal flora. Until we do, it’s still a good idea to eat a high-fiber, plant-based diet with a spattering of fermented foods like kimchi, sauerkraut and pickles. Glycogen, the primary storage molecule for glucose in the body. Currently, there are more than 24 million American diabetics and another 57 million with pre-diabetes. Diabetes is the leading cause of kidney failure, blindness, chronic nerve disease (neuropathy), and non-traumatic limb amputations. One-in-three children born today will ultimately be diagnosed with the disease if we continue down our current path. In the US, between 90-95% of all new cases of diabetes are acquired (type 2), meaning that—at least in the Western world—diabetes is a disease of lifestyle. This is both good and bad. Bad in the sense that so many are destined to develop the disease, but good in the sense that this fate is not ordained. We can change it by changing our lifestyle. While it is the glucose component in table sugar and HFCS that promotes diabetes, fructose doesn’t get a free pass. Unlike glucose, fructose is taken up via pathways unregulated by insulin. 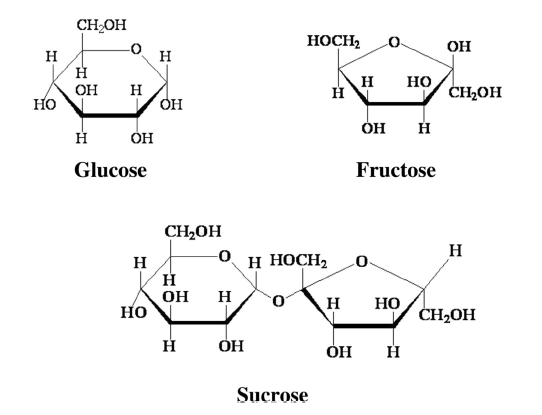 While a small portion of fructose is converted to glucose, the overwhelming majority is chemically converted into precursor molecules for fat synthesis. Additionally, fructose (unlike glucose) does not cross the blood-brain barrier and provides no energy to the brain nor any internal feedback to stop eating. Liquids, calorie for calorie, are much less efficient than solids in eliciting satiety signals. Sodas and sweetened juices represent a triple threat in promoting insulin resistance (from glucose) and fat formation (from fructose), while also failing to suppress appetite. Studies support the danger of soft drinks, as consuming just one sweetened soda per day increases the likelihood of obesity by 18% in both adolescents and adults. Another trial noted a 1.6-fold increase in childhood obesity for every daily glass of sugar-sweetened liquid consumed. 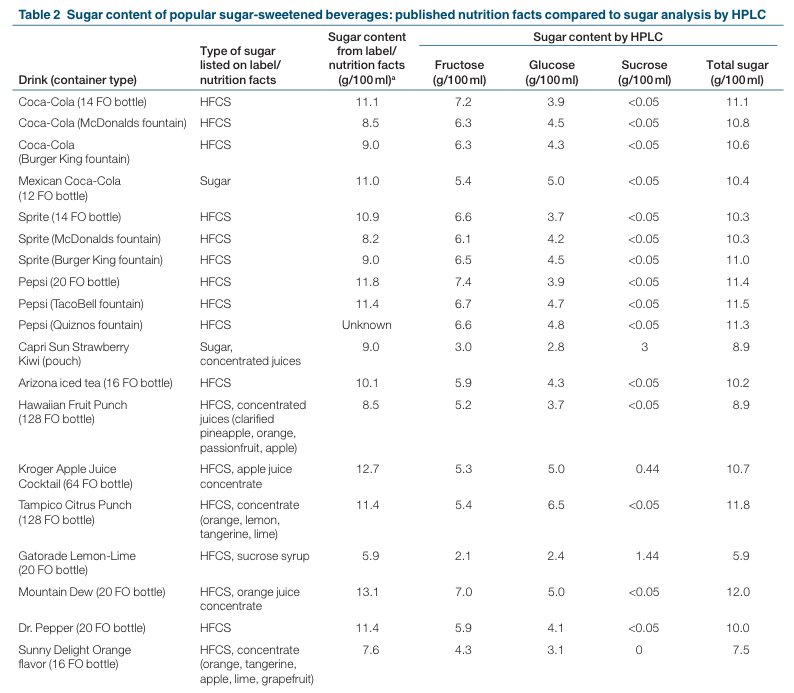 Not surprisingly, soft drinks now constitute the leading source of added sugar in the American diet. My advice here is clear; just say “no” to full sugar sodas. Sugar induces cravings in the brain and activates reward systems similar to other drugs like nicotine, cocaine, alcohol, and heroin. Rats addicted to cocaine will quickly abandon the habit in as little as 2 days when given the choice between sugar or cocaine. To be labeled an addictive drug, a substance must result in persistent, compulsive use despite negative consequences characterized by tolerance, physical and psychological dependence. Sugar, if falling short on completely fulfilling these criteria, certainly comes close. But just as Joslin’s singling out of fat as the primary culprit of diabetes and chronic disease is suspect, so, too, is Taubes’ notion that sugar is the major culprit. He makes his case citing Occam’s razor that when presented with hypothetical answers to a question, the simplest one that makes the fewest assumptions is likely correct. He quotes Newton: “We are to admit no more causes of natural things than such as are both true and sufficient to explain their appearances.” And with that, the trial against sugar continues, but the evidence presented is almost entirely circumstantial. Although there is no doubting the association between the rise of sugar and the rise of chronic Western diseases like diabetes, hypertension, heart disease, and cancer, it’s critical to remember that association is not causation. To use another example, prior to the era of vaccines, there were few cases of diabetes and heart disease, and now there are many. Therefore, vaccines must be the cause of diabetes and heart disease. Although this is an obvious example of association without causation, it serves to remind us that association is not the same thing as cause and effect. To prove causation, we need randomized controlled trial data. Unfortunately, nowhere are the trials so muddied by confounders as in the study of nutrition, and it isn’t until deep in the book that Taubes finally gets around to offering any real evidence of causation. Gout. This disease dates to antiquity but was previously restricted almost exclusively to people of wealth. The rise of gout parallels the rise of sugar (but also the rise of cheap meat, beer, and processed foods). The disease strikes when uric acid forms crystalline deposits within a joint, most commonly the base of the great toe, resulting in extreme tenderness, pain, and inflammation. As it turns out, fructose is one of the cofactors in a series of reactions that leads to the formation of uric acid, that in turn leads to gout. Glucose, the other half of cane sugar, also has a role to play by inducing insulin resistance that in turn suppresses the kidney’s ability to excrete uric acid. And thus, sugar becomes the dietary cause of gout. Hypertension. Insulin, in addition to facilitating glucose uptake, has a wide range of metabolic effects on other organs as well, including sodium retention in the kidney that in turn can lead to high blood pressure, which is why hypertensive patients are advised to limit their dietary sodium intake. Taubes makes the argument that sugar is the real culprit, with glucose stimulating sodium retention through the release of insulin and fructose contributing to sodium retention by enhancing uric acid formation that not only causes gout but also causes the kidney to retain even more sodium—a double whammy. Cancer. There are many types of cancer associated with obesity including cancer of the breast, uterus, esophagus, pancreas, colon, liver, kidney, cervix, ovary, and bladder. Excess dietary sugar leads to higher circulating insulin levels, that also results in the concomitant release of IGF (insulin-like growth factor). Not surprisingly, rapidly growing cancer cells require more glucose than non-cancerous ones (Warburg effect), and IGF facilitates glucose uptake into cancerous cells aiding their propagation. IGF also promotes cellular oxidation that, in turn, generates additional free radicals that have been shown to promote DNA-replication errors that can lead to cancer. Dementia. The process of dementia is associated with amyloid deposits and neurofibrillary tangles within the brain. To date, nobody knows whether these anomalies are the cause of dementia or an effect of it. One way in which a high sugar diet may play a role comes through observational data noting that persistent exposure to high levels of glucose leads to oxidative stress at the cellular level that enhances the formation of AGEs (advanced glycosylation end-products). AGEs, facilitate the formation of the same plaques and tangles that are seen in dementia. Although this is associative data and fails to establish cause and effect, it again implicates sugar as a potential bad actor. But there are also problems with blaming everything on sugar. Consider Japan, where rice is a staple served with every meal. Rice also happens to be a food with an extremely high glycemic index (a measure of how quickly a carbohydrate raises blood sugar levels, scored from 1 to 100, with 100 being the response to pure glucose). For example, rice scores a 73, spaghetti 49, carrots 39, and lentils 32. It’s interesting to note that fructose scores just 15 on the glycemic index, while cane sugar scores a 65. It makes empiric sense that the higher the glycemic index, the greater the insulin response, and the greater the risk of developing insulin resistance when such foods are consumed over time, but in practice it doesn’t work that way. When it comes to weight gain, the glycemic index of foods hardly matters when compared against the number of total calories consumed. Although the Japanese eat a lot of carbohydrates, they have lower rates of obesity and diabetes than Americans. Taubes explains this by noting that very few of the carbohydrate calories consumed by the Japanese come in the form of sugar or HFCS. 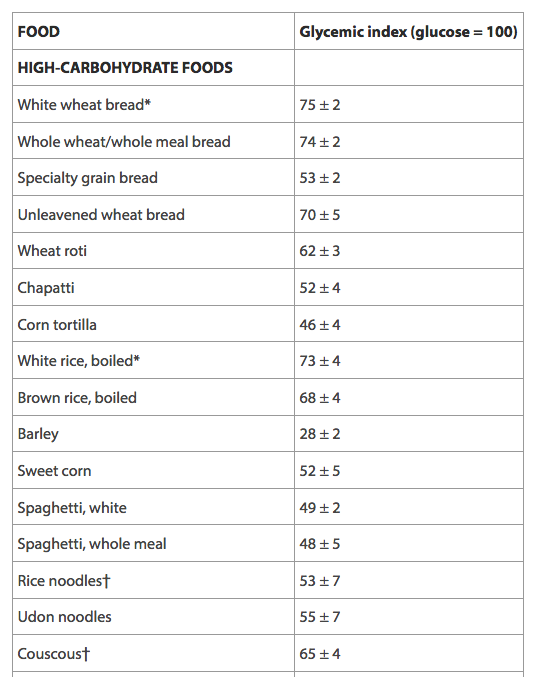 This, unfortunately, fails to satisfy for the simple reason that the glycemic index of table sugar is lower than that of rice, meaning that sugar provides less of a stimulus for insulin secretion than rice does. So, if it’s true that sugar is the problem because it sends a strong signal for insulin release, and rice provides an even stronger stimulus than sugar, then by this logic, the Japanese should have a higher incidence of diabetes and metabolic syndrome. I think the obvious answer here has little to do with sugar and everything to do with calories. The Japanese weigh less because they eat less. So, for Taubes’ theory to hold true, if the glucose component of sugar isn’t the primary driver of disease then it must be fructose (the other half of a molecule of cane sugar). Since we know that fructose is almost exclusively converted to fat, it makes sense that people who consume a lot of it should be fatter and more predisposed to metabolic syndrome than those who consume little of it. In the US, the majority of dietary fructose comes in the form of sugary sodas with a lesser amount coming from fresh fruit and vegetables. Unfortunately, the data here is conflicting. In trials that controlled for the total number of calories consumed, the percentage of fructose in the diet didn’t correlate well to fasting triglyceride or cholesterol levels. Experimental patients given an oral loading dose of fructose, sucrose (cane sugar), or sucralose (an artificial sweetener) all had similar blood levels of sugar, insulin, and triglycerides afterward. In a separate study, when men were given a 200-gram daily dose of pure fructose (an amount equivalent to drinking 2.7 liters of Coca-Cola) compared to a usual diet with similar calories over 2 weeks, there were no differences in blood triglycerides, cholesterol, blood sugar, or kidney function. Participants in the fructose group did, however, see modest elevations in blood pressure, an effect that was blocked by the administration of allopurinol (an agent enhancing the kidney’s ability to excrete uric acid, one of the by-products of fructose consumption). Although this finding supports the notion of a fructose-uric acid connection as a cause of hypertension, it does little to advance the notion that fructose is the primary dietary driver of dyslipidemia. Overall, the trial data has been inconsistent, although a 2015 meta-analysis reviewing all the human trials done on fructose found small increases in fasting blood sugar, fasting triglycerides, and blood pressure associated with high fructose consumption (but only when ingested as cane sugar or HFCS). Alternatively, diets high in natural fructose in the form of fruits and vegetables are linked to just the opposite—a lower incidence of metabolic syndrome, hypertension, and diabetes. The conclusion here is—once again—to avoid sugary soft drinks and foods high in added sugar. In his search to find a unifying villain for America’s obesity and chronic disease problem, I believe Taubes has cherry-picked. My biggest gripe is that after putting forth a rather elegant argument debunking the simplistic notion that fat and total calories alone are to blame for the nation’s obesity epidemic (“This thinking renders effectively irrelevant the radically different impact that different macronutrients—the protein, fat, and carbohydrate content of foods—have on metabolism and on the hormones and enzymes that regulate what our bodies do with these foods.”), he then attributes the problem to an equally simplistic explanation in vilifying sugar. Taubes writes in the final chapter: “Because there is sufficient reason to believe that sugars—sucrose and high fructose corn syrup in particular, the nearly fifty-fifty combinations of glucose and fructose—are the dietary trigger of insulin resistance and metabolic syndrome, it’s quite likely they are a primary cause of all … Western diseases including, as we’ll discuss, cancer and Alzheimer’s disease.” Unfortunately, this conclusion excludes a plethora of contrary data. Consider the results of a recent trial published in JAMA that compared obese participants (average BMI 33) who ate a healthy low-fat diet versus a healthy low-carbohydrate diet over the course of a year. The study also looked at genotypes associated with sugar metabolism and the participants’ insulin response to a glucose challenge (a measure of insulin resistance). This was done to determine whether individualized diets might work better in specific patient populations. In the end, both groups lost weight—not a lot, on average 5% of their pre-diet body weight, about 12 pounds—but neither diet worked better than the other, irrespective of the participants’ genetics or insulin response to a glucose challenge. The diets worked equally well to improve blood pressure, blood sugar, and lipid profiles with the low-fat diet working better to reduce LDL-cholesterol (“bad cholesterol”), and the low-carbohydrate diet working better to lower triglycerides and raise HDL-cholesterol (“good cholesterol”). It should be noted that while most people diet simply to look better, the true goal should be to improve health outcomes, and, here, neither the low-fat nor low-carbohydrate diet worked better than the other at preventing metabolic syndrome (a precursor to diabetes, heart attack, and stroke). When it comes to weight loss, this is just another in a long line of trials failing to demonstrate the superiority of one diet over another. All diets work as long as they restrict calories, although this fails to explain why individuals within diet groups lose disparate amounts of weight with the same calorie restriction. It’s here that the macronutrient composition of the calories consumed comes into play, along with our genetics, the composition of our intestinal microbiome, even the presence or absence of infectious diseases—all have roles to play. In short, there is no single dietary villain to blame for chronic disease because there is no single way that individuals metabolize the sugars, fats, and proteins they eat but, if you want to point a finger, it should still point in the direction of total calories. My advice is not to completely eliminate sugar from your diet as Taubes suggests, but rather to follow the advice of another well-known nutrition author, Michael Pollan: “Eat food. Not too much. Mostly plants.” That sums it up nicely. Next: A review of The Secret Life of Fat by Sylvia Tara—a nuanced look at the different ways in which individuals gain weight. Hint: it’s not just calories in-calories out. Gary Taubes, The Case Against Sugar (Alfred A. Knopf, New York, NY, 2016). Susan Babey et al., “Bubbling Over: Soda Consumption and Its Link to Obesity in California,” UCLA Health Research Brief, Sep 2009. David Ludwig et al., “Relation Between Consumption of Sugar-Sweetened Drinks and Childhood Obesity: A Prospective Observational Study,” Lancet 2001; 357: 505-08. Clare Gallagher et al., “Fructose Acute Effects on Glucose, Insulin, and Triglyceride After a Solid Meal Compared with Sucralose and Sucrose in a Randomized Crossover Study, J Clin Nutr 2016; 103: 1453-7. E. Perez-Pozo et al., “Excessive Fructose Intake Induces the Features of Metabolic Syndrome in Healthy Adult Men: Role of Uric Acid in the Hypertensive Response, Internat’l J of Obesity 2010; 34: 454-61. Roya Kelishadi et al., “Association of Fructose Consumption and Components of Metabolic Syndrome in Human Studies,” Nutrition 2014; 30: 503-10. Undurti Das, “Sucrose, Fructose, Glucose, and Their Link to Metabolic Syndrome and Cancer,” Nutrition 2015; 31: 249-57. Christopher Garner et al., “Effect of Low-Fat vs Low-Carbohydrate Diet on 12-Month Weight Loss in Overweight Adults and the Association with Genotype Pattern or Insulin Secretion: The DIETFITS Randomized Clinical Trial,” JAMA 2018; 319 (7): 667-79. Michael Pollan, In Defense of Food: An Eater’s Manifesto (Penguin Group, New York, NY, 2008). This entry was posted in Uncategorized and tagged diabetes mellitus, metabolic syndrome, sugar. Bookmark the permalink.